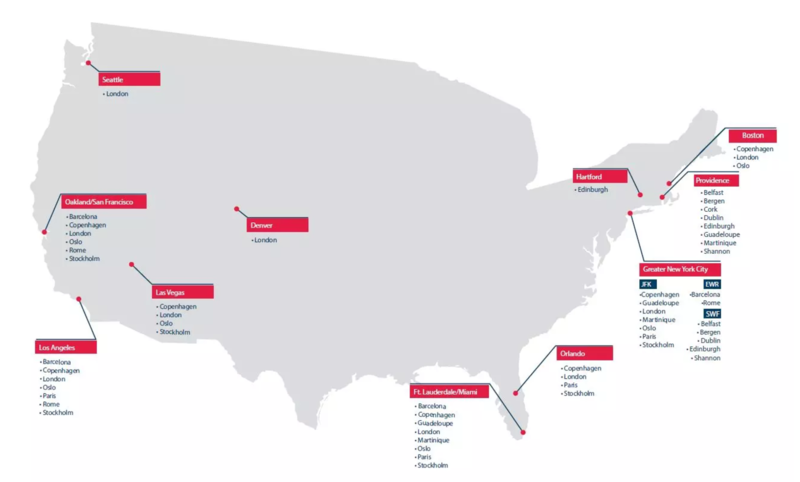 Home Airlines Norwegian Air ​Norwegian launches flights from Rome to the U.S.
Norwegian announced it will launch flights from Rome to three cities in the United States – Los Angeles, New York City/Newark and Oakland/San Francisco from November. Rome will be the airline’s seventh long-haul European destination served from the U.S. following Barcelona, which will launch this June; Paris; London; and the three Scandinavian capitals of Copenhagen, Oslo and Stockholm. Services from Newark Liberty International Airport to Rome’s Leonardo Da Vinci-Fiumicino Airport will launch on November 9, 2017, and operate four times a week until the early February 2018 when it increases to six times per week. Economy launch fares to Rome from Newark start as low as $189 one-way, including taxes. The lowest fares in Norwegian’s Premium Cabin to Rome from Newark start at $539 one-way including taxes. Service from Los Angeles International Airport to Rome will launch on November 11, 2017, and operate twice weekly until February, when it becomes a thrice weekly service. Fares from Los Angeles start from $229 one-way, including taxes. Premium fares from Los Angeles start from $719 one-way including taxes.